Jamie finally got his ring this weekend. And for a few minutes it appeared he might get another one. Joplin native Jamie McMurray, who won the Brickyard 400, one of NASCAR’s premier races last year, almost did it again Sunday. But the race was three laps too long and his fuel tank was about half a gallon too small. Our annual second treck to the first race track in the world to use the word “Speedway” always focuses on the Missouri drivers on the NASCAR circuit. We take along associates Jim Coleman and Rick Gevers to give us a second and third pair of eyes and cameras. McMurray’s cinderella year of 2010 is only a memory in what has been a frustrating 2011. But echoes of 2010 came at the Indianapolis Motor Speedway, first on Friday when he received his diamond-encrusted winner’s ring, finally. 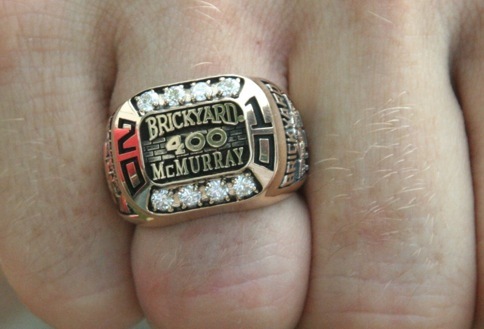 He remembered that he had been sized for the ring in victory lane a year ago but had never received the championship ring and wondered when he would. 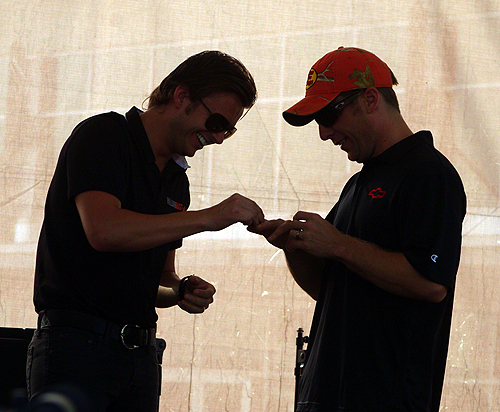 Friday, he got it, delivered by karting friend Dan Wheldon, who had won the Indianapolis 500 for a second time in May. He had nothing to lose on Sunday afternoon and as the race wound down he and his crew chief went for broke. They hoped to squeeze more than 85 miles out of the last tank of gas.This year has been a rough one for McMurray whose former home in Joplin and the high school from which he graduated were destroyed by the May 22nd tornado. On the race track a series of blown engines, flat tires, and broken transmissions has kept him far from victory lane celebrations. He’s not likely to make it to the chase for the championship without a late surge that includes a bunch of wins. But McMurray’s crew chief told him several laps after the last pit stop that the car wasn’t going to have enough fuel to make it to the end unless McMurray conserved his supply. Two laps short, he said. Five miles. Figuring that he could run more efficiently from the front, McMurrary passed leader Paul Menard right in front of us on the main straightaway eight laps from the end. He built his lead to almsot a half-second with five to go. But fuel was becoming critical and although he had saved gas, he was still an estimate half-lap short and gave up the lead to Menard with three laps left and eventually Jeff Gordon and Mark Martin got past him, too. But fourth place was the best finish of the yeard for him and he was a happy guy although he’s 28th in the points.. So one Missourian contends for a second victory in one of NASCAR’s most important venues while the second one defends his points leadership. 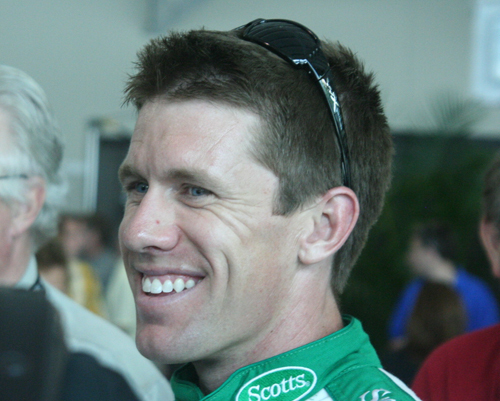 Carl Edwards of Columbia has led the points standings most of the season and was confident when we and other media members talked to him two days before the race that he had a fast car and a solid chance But his car never felt right and for most of the race he was stuck near 20th position. Late in the race, his car sustained some nose damage. But he was able to stretch his fuel load and crossed the line 14th. 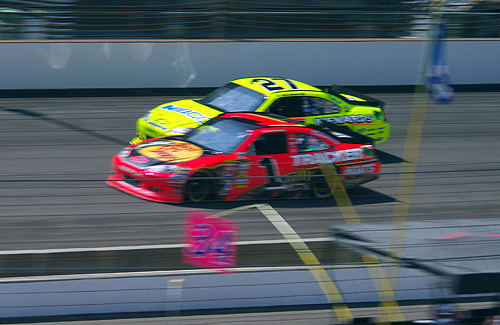 Indianapolis is a tough track for Edwards. He has only three top ten finishes in seven runs there, including a close second-place finish to Jimmie Johnson in 2008. Despite the mediocre day, Edwards expanded his lead over Johnson, the defending NASCAR cup champion, from seven points to eleven. But Edwards notes the points lead is deceptive because the real points chase begins in in about a month, the final ten-race shootout. And part of that points standing is based on the number of wins this year. He has one. Others have more. 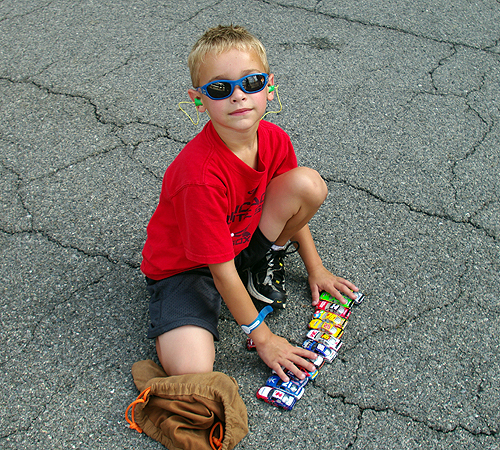 If the “Chase,”: as it’s called were today, he thinks he’d be starting off about fourth. He admits the pressure is growing to win races, not just protect a points lead. And while all of this is going on, he’s dealing with whether to sign a new contract with his present team or jump to another team and another brand of car. He won’t respond to that speculation, saying he has a contract with his present company and his contract is for him to win—and he’s dedicated to that contract. The Speedway is a great place to people-watch, too. Fans or potential fans of all ages (and even some that are dangerously close to being born on the yard of bricks , but we won’t show you that picture), from those getting around with walkers and wheelchairs to those who will be the next generation of NASCAR loyalists are all a part of the ambiance of the event. On practice day we saw this little boy right behind the fence separating the crowd from the pits, putting together his own starting field while the big world roared by, shaking the ground on which he sat. Indianapolis gave us a chance to touch base with our top Missouri drivers. It’s important to get away from covering disasters and politicians and speculation about who’s running for what office and whent they’ll announce and all that stuff. But then again, in the last week we’ve been in on discussions about Joplin with Jamie McMurray and a discussion with Carl about who he’s going to be running for next year and when we’ll learn. It’s not all that much different from what we do in our regular life, come to think of it. Except it’s a whole lot louder—Good Lord, but is it ever!—and the participants go a lot faster. Rascal Flats sang the national anthem and Reba sang America the Beautiful at Indianapolis. So far the Missouri legislature hasn’t found anything to match that. If nothing else—and athere are, in fact, plenty of other “elses,” that music is another reason why a trip to two to the self-proclaimed world’s greatest race course is good for this reporter’s soul.